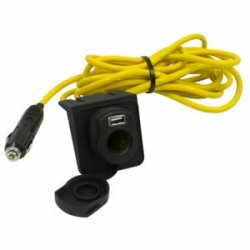 This 12 volt extension cord allows you to easily extend your existing 12 volt outlet. It includes an optional mounting bracket for permanent installation. It also features a 5V USB power port for all of today's modern devices. When plugged into power the USB port lights up blue. The cord is 12-feet long and is brightly colored for added safety. Just what I needed. Works as described. I use it without the mounting bracket. The cord is soft and flexible not cheap plastic housing. Thumbs Up!